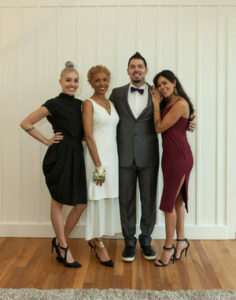 Meet Later Mom Deborah Santana (Interview by Robin Gorman Newman) | MotherhoodLater.com - World’s leading website, eZine and community for midlife moms. My professional life is in philanthropy. 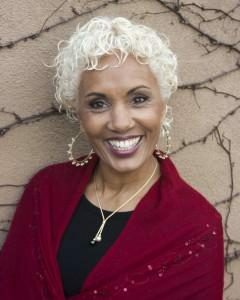 I am CEO & Founder of Do A Little Foundation which serves women and girls in the areas of health, education & happiness. 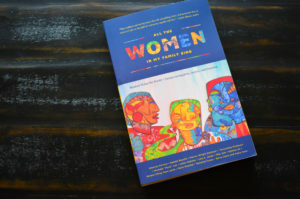 For the last 3 years, I have worked as co-publisher and editor of the anthology All the Women in My Family Sing, essays from 69 women of color about their lives and the impact of ethnicity on success, access & personal challenges. What was your road to parenthood like? I was married 10 years before we had our first child when I was 32. I had owned, managed and worked in our vegetarian restaurant in San Francisco from the age 22 and traveled the world. When you became a mom for the third time at 39, did it feel different than when you were younger? Having 3 children was very different than having 2, and I loved our bigger family. My energy was great at 39 – I had always been a runner and kept exercising through all of my pregnancies. How does being a mom influence your work? Did you work when they were little? Being a mother greatly influences my philanthropic work because my children were able to attend the best schools, were able to receive music lessons, play on sports teams, travel & work with tutors or have whatever they needed to achieve their highest goals. I am aware that so many children do not have the same opportunities and I work to fund organizations that educate girls as girls are still undereducated in the larger world. I took time off from full-time work until my youngest was 5. Then I became COO & Vice President of our family music business. What inspired you to launch a non-profit? My first non-profit was the Milagro Foundation, which our family founded in 1999 as a result of the many requests we received to help people who were struggling. What do you hope readers will take away from your new book? There is a need to illuminate the diversity and complexity of women’s experiences in the world. I want people to be inspired by the essays in the anthology and to realize that all people are more alike than we are different. The collection of prose and poetry includes such topics as learning to embrace one’s transgender journey and standing for truth, the pressures of being a woman of color as a top executive at a Fortune 500 Company, escaping the killing fields of Cambodia, and the struggles inside immigration, identity, romance, and self-worth. What advice would you offer to multi-tasking overwhelmed moms? The years we have with our children go by so quickly. I look back and think that I could have spent even more time enjoying my little ones, teaching them more about life, and not been so concerned with having so many activities that kept us all busy. I believe every mom knows in her heart what is important to achieve and what might be released so stress is not the core of our lives. Do you think it’s tough for women to balance parenting, a personal life and professional pursuits? I do think balancing the personal and professional is difficult in the western world. I loved being home with my children, but many women are happier working. I had the privilege of being able to work from home 3 days a week and going to the office 2 days. It was the perfect balance for me, yet I still added on other work, returning to college, and volunteering! What do you see as the positives and challenges of having a child at age 35 or over? From my own experience, there were no challenges having children in my 30s, and the positives were that I had traveled the world and owned and managed a vegetarian restaurant in my 20s without having to divide my attention. Has anything about being a mother surprised you? If so, what? What do you love the most about it, and what is the most challenging? Everything about being a mother surprised me! The depth of love, the honor of carrying life in my body and the miraculous painful process of giving birth. I did not have an epidural until my third birth and I remember saying, “This is the way to have a baby!” But, in truth, I am thrilled I had the experience of natural childbirth and the feeling of the momentous movement of life in the birth canal. It is a metaphor for raising children, really. The pain of birth foretells the journey of life. Being a mother has fulfilled me, enriched my life, and taught me to let go. That is the most challenging part of parenting – you are given this baby who you must sacrifice so much to feed, clothe, teach, and protect. Then, they become adolescents and need to push you away so they can find their own purpose and identity. I am still learning how to parent. What did you most want to teach your children when they were growing up? What have you learned from them? I wanted my children to have an inner connection with God’s spirit and to believe in the sanctity of life, that the soul is our source of nourishment and truth. I have learned so much from them about courage, faith, resilience and joy. Given the talents of you, and the children’s father, Carlos, are your children musical or involved in creative pursuits? Salvador, Stella and Angelica are all creative beings. Salvador is a professional musician, songwriter and has toured extensively. Stella is a songwriter and singer who is beginning her professional career. Angelica is an artist and writer and also sings and writes her own music. Did your parents offered any particular parenting advice, when your kids were young, that really resonated with you? My parents were quite involved with my children’s lives as they were with my sister and me. What they taught was to be present at school concerts, games, attend everything the children were involved in and to give them boundaries and provide structure to their days, so they will know they are loved and safe. What do you know now that you wish you knew when your kids were little, about parenting? “Hang on tightly, let go lightly.” That is a line in the essay A Photograph of Martin by Marti Paschal in our anthology. Do you have any particular memories from your own childhood that inspired you to make memories with your children? My mom and dad loved to take drives and see new places. We grew up in California and I fondly remember long car trips reading in the back seat, stopping at roadside cafes, and lots of laughter. I always wanted our family to be together, and we traveled to many beautiful locales when the children were young with grandparents, aunties and friends – a beautiful community. What words of wisdom would you like to share for someone contemplating motherhood over age 35? Make sure you are at peace with yourself so you can enjoy the life you bring into the world.